FILE - People on motorcycles ride past buildings destroyed during the fighting in the northern town of Ariha, in Idlib province, Syria. Ariha is one of five main towns in Idlib province and the last place to fall to rebel control in 2015, Sept. 20, 2018 photo. Turkey's hosting of a four-nation Syrian summit later this month is a diplomatic win for President Recep Tayyip Erdogan. With Syria's reconstruction, a key item of the planned meeting of French, Russia and German leaders, Erdogan will be looking to strengthen Turkey's hand in the predicted building bonanza. "It is very important (the summit). After every war, reconstruction is always important, and Turkey will probably be one of the key players in this role," said international relations professor Huseyin Bagci of Ankara's Middle East Technical University. "This will be economically advantageous for Turkey." The timing could not be better for Turkey, with the economy facing a looming recession after this year's collapse of the currency. The Turkish construction industry is particularly stricken by the country's economic woes, with many companies reportedly in financial difficulties. The building sector is one of Turkey's biggest employers. "Turkey is facing a stagflation situation," said former senior Turkish diplomat Aydin Selcen. "The opening of Syria just next door to Antep Hatay and Kilis (Turkish provinces) as a new market is important for Turkey." "When we enter the reconstruction phase, it will be another win for Turkey," he added, "And Turkey might turn a blind eye to (Syrian President Bashar) Assad staying in power." 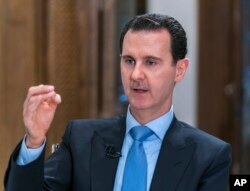 FILE - In this photo released June 13, 2018, by the Syrian official news agency SANA, Syrian President Bashar al-Assad speaks during an interview with Iran's Al Alam TV, in Damascus, Syria. Ankara cut diplomatic relations with Damascus at the start of the Syrian civil war and remains committed to Assad's removal from power. However, with the Turkish construction industry in trouble, analysts suggest Erdogan has a vested interest in repairing relations with Damascus. Damascus may not be in a generous mood toward Turkish companies. Assad holds Erdogan responsible for the destruction of Syria because of his support for the rebels. "To what extent the regime will have control over how this reconstruction program is going to be implemented will be key," said Sinan Ulgen, head of the Istanbul-based Edam research organization. "Because the animosity between Ankara and Damascus will not evaporate, and that will certainly limit how active the Turkish contractors can be." Ankara may not be counting on needing Assad's goodwill. Turkey has taken control of a large swathe of northern Syria in a series of military operations against Islamic State and the Kurdish YPG militia. Ankara considers both groups as terrorist organizations and a security threat. A man rebuilds a wall of a damaged building in the rebel held al-Katerji district in Aleppo, Syria, Aug. 13, 2016. Analysts point out that Ankara is likely calculating that the control of Syrian territory will give it leverage over Damascus and a say over the outcome of post-war Syria. This month, Erdogan made clear there would be no early Syrian withdrawal of Turkish forces. "Whenever the Syrian people hold an election, we will leave Syria to its owners," he said Thursday. Turkish construction firms are already engaged in building projects across Syrian territory under Ankara's control. But observers say Erdogan is eyeing the rebuilding of Syria's second largest city, Aleppo, 50 kilometers (31 miles) from the Turkish border. Analysts suggest Ankara will be looking to Moscow for support. "Turkey does not talk to Bashar al-Assad. (But) that does not mean that Turkey is not going to play the (reconstruction) role," said Bagci. "Turkey will go through Russia. Also, Russia will stay there (Syria) for now and forever." Erdogan has developed a close relationship with Russian President Vladimir Putin, built on cooperation over Syria. Though the two leaders back rival sides in the Syrian civil war, analysts say there is a recognition they need one another to end the conflict. Syria's reconstruction nearly always features prominently in the regular meetings between Erdogan and Putin. Economic cooperation is also an essential component in deepening Turkish-Russia ties. Syria's reconstruction offers the opportunity to further cement bilateral relations. Analysts point out that who finances Syria's reconstruction will likely have a big say on who benefits from any construction boom. The United Nations put a price tag on rebuilding Syria at $388 billion. "UAE and Saudi Arabia are appearing to be softer toward Damascus, and maybe they believe they can drive a wedge between Damascus and Tehran," said Selcen. "Now, we are moving to reconstruction phases. Saudi Arabia and UAE have deeper pockets than Tehran. And this is what Germany is telling Damascus." With Turkey having the longest border with Syria and the region's largest and most developed economy, analysts suggest it remains well-placed to exploit any construction boom in Syria, whoever secures the rebuilding contracts. "If Turkish contractors (are) not able to get these precious contracts from Syria," said Selcen," once the reconstruction starts, Turkey will gain a lot by exporting food products and reconstruction materials."